Powered anesthetic injector provides a more comfortable, practical and effortless injection. Delivers consistent and reproduceable injections, with less pain to the patient. Works with all standard anesthetic cartridges and dental needles. No training needed. Intuitive buttons to easily set your desired injection preferences. 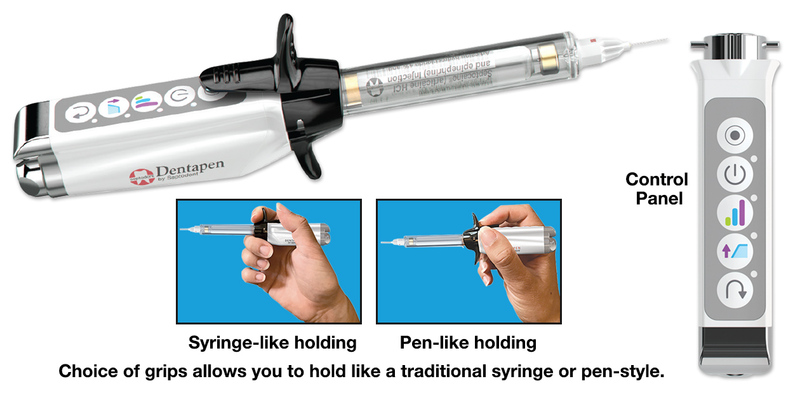 2 finger grip options to select syringe-style or pen-style holding. 2 year manufacturer’s warranty on the unit; 3 months on cartridge holders and finger grips.